Speakers: Ambassador Harry Harris, U.S. 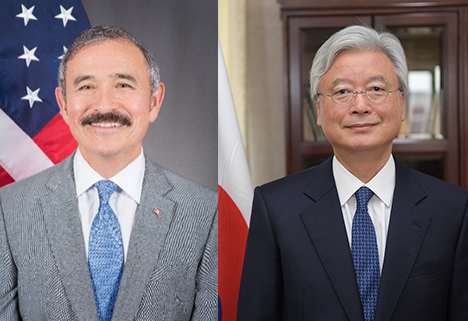 Ambassador to the Republic of Korea; Ambassador Yoon-je Cho, Ambassador of the Republic of Korea to the U.S. The U.S. relationship with Korea long predates the security partnership formed after the Korea War. The first treaty between Korea and the United States was signed in 1882. Since the establishment of the Republic of Korea in 1948, the relationship between the two countries have become broad-ranging. In addition to the large Korean-American community forming a bridge between the citizens of both countries, the ever-increasing volume of trade between the United States and South Korea make the two countries a significant source of one anothers economic prosperity. Notably, the U.S. monthly export of merchandise to South Korea reached a record high of $5.6 billion in December 2018. These burgeoning ties further accentuate the importance of addressing security concerns on the Korean Peninsula, particularly North Koreas nuclear program. With this backdrop, UC Berkeley hosts Ambassadors Harris and Cho for a discussion on the future of the alliance. This evenings event is part of the Ambassadors Dialogue program, organized by the Korea Economic Institute. This is a unique program that provides the public with an opportunity to directly engage the ambassadors. Cho Yoon-je was nominated as the Republic of Koreas ambassador to the United States by President Moon Jae-in on August 30, 2017. In addition to his postings in the South Korean government, he was the South Korean ambassador to the United Kingdom (2005-08) and advisor to President Roh Moo-hyun on economic policy (2003-05). Ambassador Cho began his career as an economist at the World Bank (1984-1989) and the International Monetary Fund (1989-1992). He was trained in the Department of Economics at Seoul National University (BA, 1976) and Stanford University (MA and Ph.D. in Economics, 1984). Harry B. Harris Jr. was sworn in as U.S. ambassador to the Republic of Korea on June 29, 2018. Prior to his nomination, Ambassador Harris was a career naval officer, heading the U.S. Indo-Pacific Command from 2015 to 2018. He retired after 40 years in the service as a 4-star admiral. He was decorated by not only the United States and the Republic of Korea, but also the governments of Australia, France, Japan, Mongolia, the Philippines, and Singapore. Ambassador Harris graduated from the U.S. Naval Academy in 1978. He holds masters degrees from Harvards Kennedy School of Government and Georgetowns School of Foreign Service. He also did post-graduate work at Oxford University and completed the Seminar 21 fellowship at the Massachusetts Institute of Technology.